If your hair is thinning or absent, you may notice lumps on your scalp that you were not aware of before. Sometimes these lumps can be a contributory factor in your hair loss. Sometimes they indicate other types of problem. Even if they are benign they can make your head look unsightly. How can you find out what they are and what to do about them? The most common causes of lumps found on the scalp are dermatitis and allergies. Although these can be very unpleasant they are not dangerous. They can, however, contribute to Hair Loss. Dermatitis usually develops when too much oil is released by the sebaceous glands which lubricate the hairs on your head. 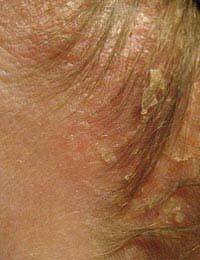 People with dermatitis often suffer from acne as well. The excess oil can dry and crust over, forming lumps that suffocate the skin underneath. This can lead to itching. You can treat dermatitis with medicated shampoo available from any pharmacist. Allergies can lead to the development of hives on your scalp. These are small and may be reddish in colour or may look white against a reddened background. Scalp allergies can be cased by lots of different factors, including foods and hair products you've been using without problems for years. Ask your doctor about patch testing to discover the cause. Cysts develop when an area underneath the skin, at the base of a hair follicle, becomes clogged up with naturally produced fluid that then hardens. Because further fluid naturally accumulates around them, they can grow quite big. Often the skin will feel tight over them. Untreated cysts can remain on the scalp for years without causing problems, but they can place you at increased risk of infections, especially if they break the skin. Usually, the only way to remove a cyst is with surgery. This does not, however, mean that you'll need a big operation. A doctor can do it very quickly and easily after giving you a local anaesthetic. Anaesthetics in the scalp are very effective so you are unlikely to feel anything more than a bit of pressure. You may have a small scar as a result. Sometimes circulatory disorders mean that materials are not distributed properly around the body. Lumps of these materials can build up against any hard, bony surface, with the scalp being an obvious place. Fatty lumps are the most common and do not usually indicate any serious health problem. They may go away by themselves over time, or they can be removed via surgery. Calcinosis occurs when the body cannot properly distribute calcium. Lumps of calcium carbonate, or chalk, can build up under the skin. This can be an indicator of serious illness so should always be thoroughly investigated by a doctor. The lumps, which may feel hard or soft, are not dangerous in themselves, though if they break the skin they can lead to infection. If you have calcinosis it is important not to try to cut out calcium from your diet. In fact, you may need to take a supplement, because calcium going to the wrong place means it's not going – in sufficient quantity – to the places where it's needed. When you find a lump on your body, it's natural to experience a moment of panic and fear that it might be cancer. In fact, cancer is one of the less common causes of lumps on the scalp, but the fact it is a possibility means you should always get them checked out. Some people who find lumps worry that they might have brain tumours. It is very rare for a tumour in the brain to be noticeable on the surface of the scalp – if you think about it, it would have a lot of soft brain tissue to expand into before it started putting pressure against the hard bone of the skull. Occasionally, bone cancer can manifest on the skull. Your doctor can easily test for this. A far more common cause of lumps on the scalp is skin cancer. This can be an extra risk for people who have experienced hair loss, and is one of the reasons why it's a good idea to wear a hat or scarf when you're outside in the sun. Lumps caused by skin cancer are often darker in colour than the surrounding skin. They can grow quite quickly, but if you catch them early, they are very treatable. This means that you should not delay in seeing your doctor when you find a lump on your scalp. Quick intervention could mean that a serious danger becomes just a minor annoyance, and then you can get on with your life. My husband went to sleep and woke up with a bald spot on the side of his head. He said the spot is a little sore when pressed but he didnt hit his head or anything. It just appeared out of nowhere overnight. Sny ideas?? My son had a hard bump on his scalp that was tender if touched but not hot or red. There was no white head or any sign of infection.because it was painful we assumed he possibly hit it but he did not remember doing so. Days later he lost his hair over the spot lesvubg him with a bald spot the size of a nickel getting larger by the day. Any thoughts what this could be? Please get a GP to look at this. We can't really give advice on specific/individual cases. My son had a hard bump on his scalp that was tender if touched but not hot or red. There was no white head or any sign of infection....because it was painful we assumed he possibly hit it but he did not remember doing so. Days later he lost his hair over the spot lesvubg him with a bald spot the size of a nickel getting larger by the day. Any thoughts what this could be? I have had horrible headaches for years. I've been to the ER several times and was never able to see a neurologist. A couple of months ago the area that I normally have (sight distorting headache) the hair is like completley gone. A small bald spot. I thought it was really weird but I started taking some vitamins and the hair is growing back. Tonight I find a pretty big lump in the same exact area and it's causing a bad pain. I'm so sick of being sent away from the ER I won't go and I cannot afford a doctor right now. Has anyone had this happen and figure out what it was??? I'm desprate for help!